The necessity of periodic inspection of connecting rods is known to the operators. Connecting rod big end bore hastendencyto develop taper, ovalityandcracks after certain hours of operation. The small end bore also gets damaged. We deputeteamof experienced technicians to the site withcompleteset of instrumentation and crack detection kit. 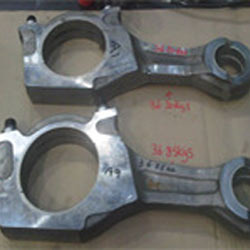 The connecting rods are checked for their big end bore, small end bore, cracks andother parameterwhich are important for the satisfactory running of the engine. 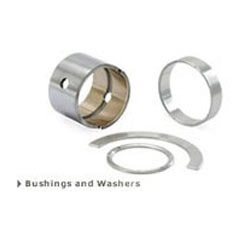 Connecting Rod Bushings are offered in quality finish and come manufactured using aluminum, silicon or bronze metal options. Further, we can also deliver these bushings in metal finish options comprising nickel, tin, copper and beryllium copper as per specific customer demands. Made available for both extreme loads and for medium load applications, these are delivered with best press fit for all materials as well as in superior corrosion and load resistance properties. 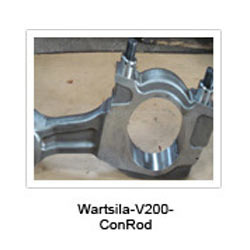 Connecting Rod Marine Engines are precision constructed connecting rods that find application in marine engines. These connecting rods support the needs of connecting inside powerhouse of engine to outside portion used for converting power into mechanical energy. Used for converting reciprocating motion of piston into rotary motion of crankshaft, these are forge-manufactured in mild/medium carbon steel finish. Connecting Rod Bearing developed by us come precision designed and are designed to play main support for achieving optimum load carrying applications. Playing an important part in rotating assembly, these can be used with reconditioned connecting rods, new connecting rods and are made using quality material support that enhances the longevity of engine. Further, our in-depth process knowledge also allows us to deliver these in customized finish specifications. 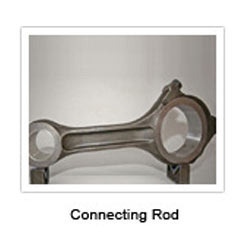 Engine Connecting Rods are made available in nickel, chrome, moly, vanadium alloy finishes and can be delivered in conformance to desired physical and chemical steel properties. These rods are developed while maintaining close tolerances of heat treat processes that support maintaining critical elements of ductility and low notch-sensitivity. Further, the use of latest CNC machines allows us in accurately validating dimensional integrity of the products. 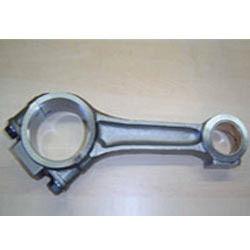 Piston Connecting Rods are used for connecting piston to crankshaft and find suitable to be used in piston engines with crossheads like large marine diesel engines and steam locomotives. Here, our expertise lies in successfully handling emerging design and engineering challenges. Further, the optimum utilization of available technology support also allows us to ensure delivery of best products to the customers. 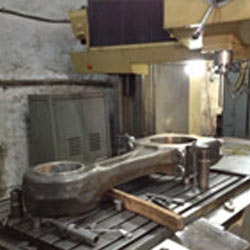 Connecting Rod Machining services offered are delivered using latest technical support which allows connecting rods to withstand greater power loads. Further, the use of higher-strength material also makes these deliver optimum functional performance. Here, our expertise lies in delivering connecting rod machining solutions for commercial vehicles, passenger cars in different forging weights with added advantage of bringing improvements in field of fracture-split and strength. CKD Skoda Connecting Rods are made available in precision engineered finish for diesel engine and are developed to deliver consistent working under high stress. Providing support for connecting piston to crank/crankshaft, these form mechanism of converting linear motion into rotating motion or vice versa. Further, these are suitable to be used in internal combustion piston engines like that of cars and are backed by closer tolerances and strict quality control.